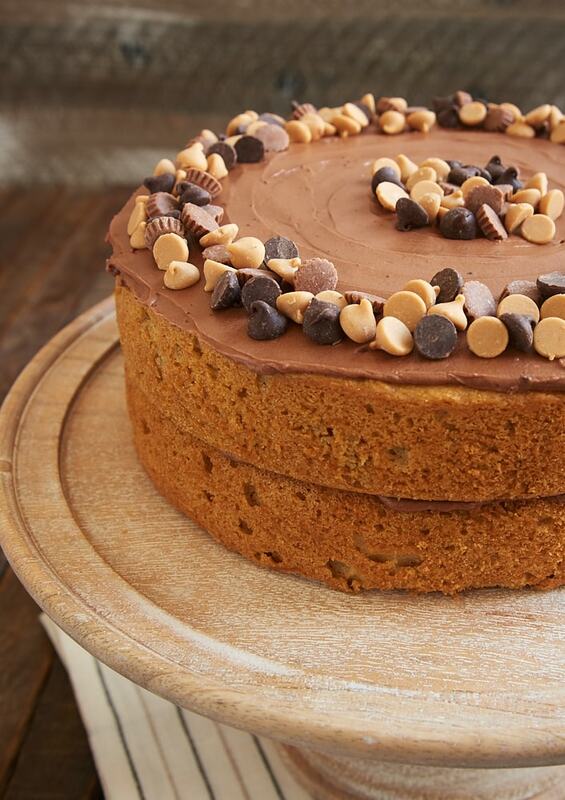 A few months ago, Quinn suggested that I make a peanut butter cake with chocolate frosting. I mentally noted that and went about with various other baking plans. I held on to his suggestion until this past week when he celebrated his birthday. I waited until he left for work and then got in the kitchen and made it as a surprise for him. I even got it photographed the same day so I wouldn’t do that annoying food blogger thing where I have some awesome dessert made but won’t let him eat any of it until I can photograph it. Bless him, he learned a long time ago to eat the ugliest cookie on the cooling rack. But let’s get back to this amazing cake. The layers are so nice and tall. And they have a lovely peanut butter flavor. But the best part, at least to me, is the texture of the cake. It’s so soft and moist. I’d be happy with a piece of that cake unadorned. Just slice it up and hand me a fork! Of course, the frosting is what makes it extra special. What better to pair with peanut butter than chocolate? The frosting is a simple one with big, fabulous chocolate flavor. It pairs perfectly with the cake. The lack of frosting on the sides of the cake isn’t purely an aesthetic choice. Quinn and I both prefer a higher cake to frosting ratio, so I usually dial back the frosting and limit it to the tops of the layers. Of course, if you are a big frosting fan, just increase the frosting recipe by half or even double to cover the sides. The sweetness level here is a bit higher than the things I usually bake. But birthdays are a great reason for a full-tilt dessert, right? And I’m happy to tell you that the birthday boy thoroughly enjoyed his cake! 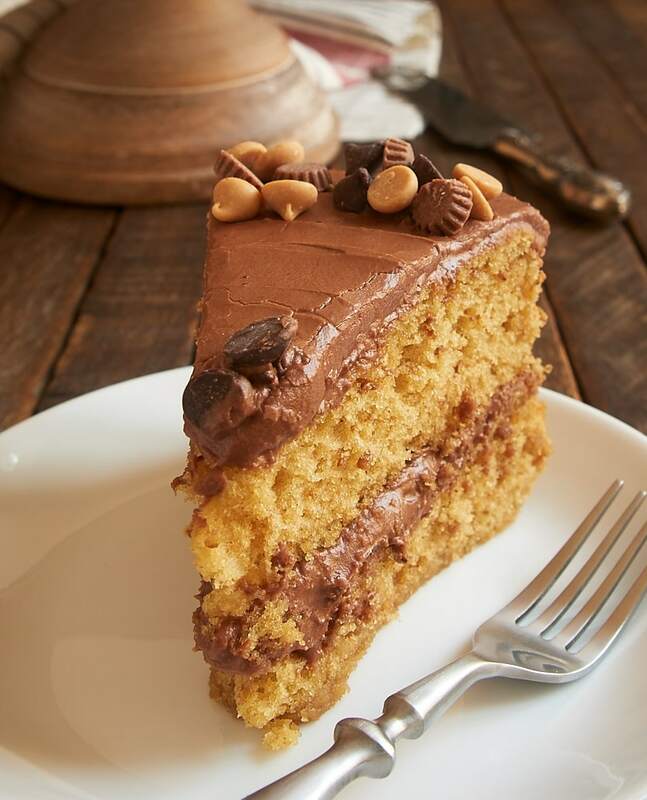 Fans of chocolate and peanut butter will be wowed by this beautiful, sweet, delicious Peanut Butter Cake with Chocolate Frosting! Preheat oven to 350°F. Grease two 9-inch round cake pans. Line the bottom of each pan with parchment paper. 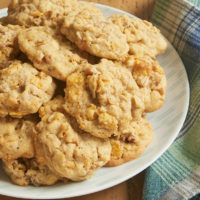 Using an electric mixer on medium speed, beat the peanut butter, brown sugar, sugar, and butter until fluffy. Add the eggs, one at a time, mixing well after each addition. Mix in the vanilla. Cool the cakes in the pans on a wire rack for 15 minutes. Then remove the cakes from the pans to a wire rack, remove the parchment paper, and allow them to cool completely. Using an electric mixer on medium speed, beat the butter, about half of the cocoa powder, and the vanilla until light and fluffy. Gradually add 1/4 cup milk, and mix well. Add the remaining cocoa powder, and mix well. 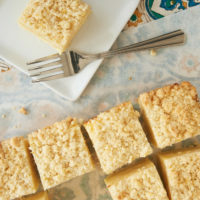 Gradually add the confectioners’ sugar** and continue mixing until thoroughly combined. Place one cooled cake layer on a serving plate. Frost the top with about half of the frosting. Place the other cake layer on top of the frosted layer. Frost the top with the remaining frosting. Garnish if desired. 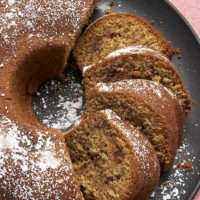 *I’m not a big fan of sifting, but sifting these two ingredients will make your frosting much smoother. 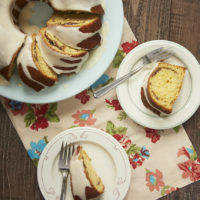 **Confectioners’ sugar added during mixing can make a really big mess. To keep the mess to a minimum, I recommend spooning the sugar into the mixing bowl in small increments. I add about a tablespoon or so at a time while continuing to mix. That Quinn is one lucky guy! Glad you both enjoyed this beautiful cake. Quick question for you……can this be made into cupcakes? How long do you think the baking time would be? 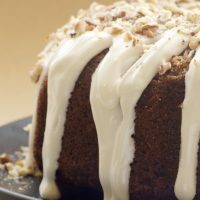 Thanks for another delicious recipe….happy spring! Thanks, Marianne! I’ve not tried this recipe as cupcakes, but it should be no problem to convert it. My guess is they’ll need 15 to 20 minutes, depending on your oven and pans. Thanks for the quick reply. Have a nice afternoon! Cake looks incredible and you made me snort! ” He learned a long time ago to eat the ugliest cookie on the cooling rack” Ha ha! Peanut butter and chocolate are one of my favorite combination! What a great birthday cake! I didn’t have any big baking plans for this week…UNTIL NOW. Can’t get this out of my head! 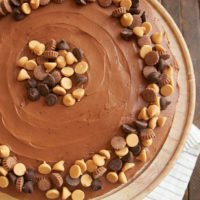 The cake looks delicious and I can never resist peanut butter and chocolate! Thanks for sharing. I didn’t use the parchment paper, will I have a problem with removal of the cake . I did grease the pans. The parchment paper makes it much easier, but it’s not absolutely necessary if your pans are well-greased. This looks like a perfect dessert for a special Mother’s Day meal. Looking forward to trying it out. Looks fantastic! One question – is it ok to use natural peanut butter, and not the stuff with added sugar/trans fats (e.g. Jif, Skippy, etc.)? Hi, Sarah! Natural peanut butters are usually thinner, so it might create a bit of a difference in the batter and the texture of the finished cake. I’ve not tried this cake with a natural peanut butter, but I don’t think you’ll end up with anything vastly different. There will be a bit less sugar in the cake, but I wouldn’t necessarily add more to the cake. Check the ingredients list on your natural peanut butter. If there’s no salt added, you might want to bump up the salt in the recipe just a tad. Does it need to be refrigerated after it’s made? I would refrigerate if it won’t be eaten within a few days. It will keep longer that way. 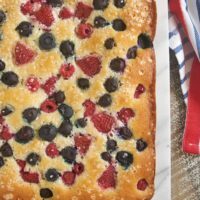 Is there a way to make this with no eggs? My nephew is allerigic to eggs. I saw somewhere about replacing each egg with 1/ 4 cup mashed banana. Any suggestions with replacingeggs in a recipe. Hi, Jenn. I don’t have much personal experience with making that kind of substitution, so I can’t offer firsthand advice. I’ve read that you can substitute 1/4 cup mashed banana or applesauce per egg. 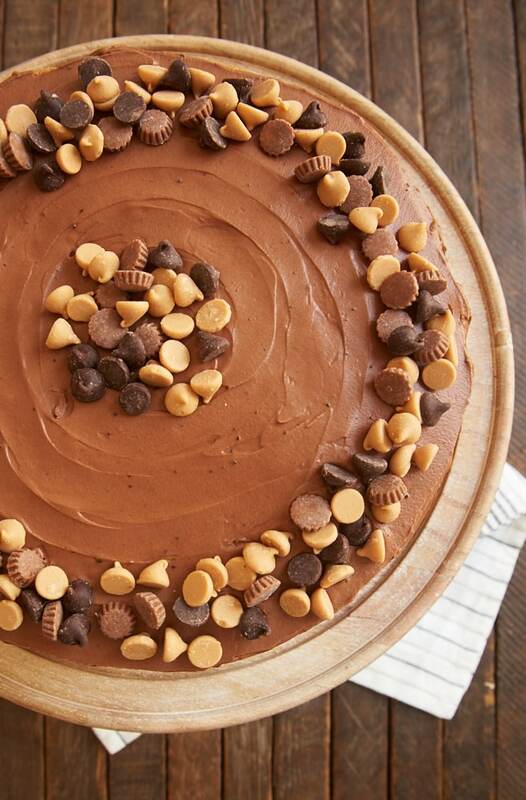 If you have good luck with a substitution for this cake, be sure to let us know. Ok, just made it without eggs using 1/4 cup mashed banana per egg. Omg the batter tastes amazing. Like a peanut butter banana sandwich. It’s still in the oven, but i cannot wait to slice into it. Tasted soo good and the batter consistency was not altered so fingers crossed!